Perfectly Located Downtown RMB Condo with Gulf Views - Includes 2 Bikes + 4 POOLS to Choose From! 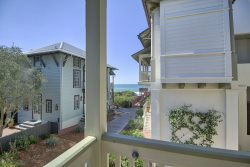 Welcome to Savannah 2C, located on the South side of the renowned scenic highway 30A, in the heart of Rosemary Beach. Encounter the lifestyle and experiences only Rosemary Beach has to offer. Centrally located to the most pristine restaurants, unique boutiques, bike trails, & golf courses. The kids will cure their sweet tooth at the Sugar Shack based out of the Savannah building, while Dad plays a round of golf, and mom shops at Pish Posh Patchouli's, there is truly something for everyone! Savannah 2C has private parking for up to two vehicles, situated in the front of the Savannah building. This unit is a two bedroom, two bath, and accommodate up to four people. Both master suites are furnished with cozy king size beds, TVs with cable, and private access to the balcony. In the open concept, main living area, you will find seating for five. The dinning area can accommodate four, with two additional bar stools are the breakfast bar. The updated kitchen makes cooking enjoyable, where you'll come across every essential needed to prepare a gourmet meal for your family. After a long day playing at the beach, bask in the sunset on the 545 square foot veranda with an EXPANSIVE view of the Gulf. Here you will take pleasure is the one of the most exclusive balconies Rosemary Beach has to give. The veranda is furnished for your comfort, with a seating area, dinning area, and lounger, you will never want to leave Savannah 2C! Weekly & daily memberships for tennis & fitness center are available for our guest. 30a Escapes provides the best customer service that I could have ever asked for. Booking was a snap. My wife forgot her power cord to her computer and our agent found one in his office and let us borrow it for the week. Everything was fantastic! Laura was very helpful during our planning and answered all my questions in a timely manner. We loved the property and it was perfect for our weekend get away to celebrate my mother's 70th birthday! Very helpful...the patio was AMAZING!! The view was incredible! Close to everything! Love the location! Dylan was absolutely fabulous! He answered every phone call when I had questions. He is very thorough and very nice. The property was wonderful, I would stay here again in a heartbeat. I just like to go to different places. Loved our visit to Rosemary Beach and this property! Dylan was awesome! He was such a pleasant point of contact! Very enjoyable. Lovely community and vacation rental, responsive guest services. Very easy working with Dylan, fast & efficient! Beautiful property, very well maintained and relaxing!